Welcome to the Valley Interational Airport in Harlengin. Welcome to The Rio Grande Valley, located in the southernmost tip of Texas. Stretching from South Padre island on the Gulf coast to the historic town of Rio Grande City, "The Valley" is located directly across the border from Mexico. Dating from colonial days of Imperial Spain, The Valley's history covers periods of exploration, wars, and revolutions. With our semi-tropical climate and proximity to both Mexico and the Gulf Coast, The Valley makes an ideal vacation destination from warm sandy beaches, diverse shopping venues to bird watching and wildlife hunting. The Valley has something for everyone! 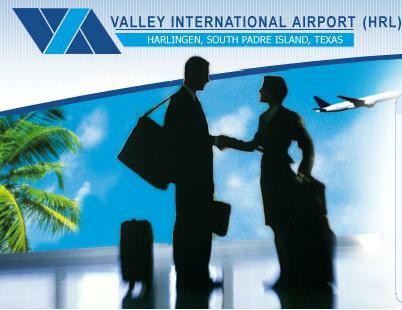 Valley International Airport is your gateway to the Rio Grande Valley! 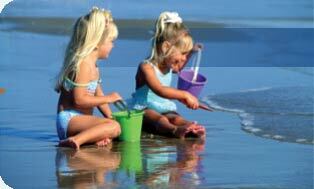 Welcome to a land rich in culture, history, adventure and excitement. In this section, you'll find maps and other important information to help make your stay more enjoyable. You'll also find out about the main passenger amenities available at Valley International Airport that makes our airport the choice of smart travelers. Strategically-positioned, Valley International Airport has a service area (within 40 miles of HRL) with more than 2 million citizens of the Lower Grande Valley and Northern Mexico. 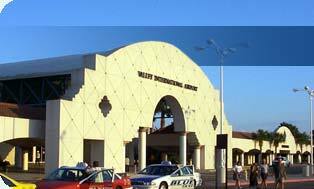 The airport lies approximately mid-way between Brownsville and McAllen, and offers an attractive border-crossing option via the Free Trade Bridge at Los Indios. Valley International Airport is different. We take pride in our modern award-winning airport, and our passengers love it. Busy travelers can take advantage of our free Laptop Work Areas, kids can play away from the crowd at the popular KidsPort, and business travelers can get away to privacy in the Gate 8 Executive Lounge. A video arcade is located across from the restaurant on the first floor and an award-winning wildlife photo gallery is located across from the Southwest Airlines ticket counter.